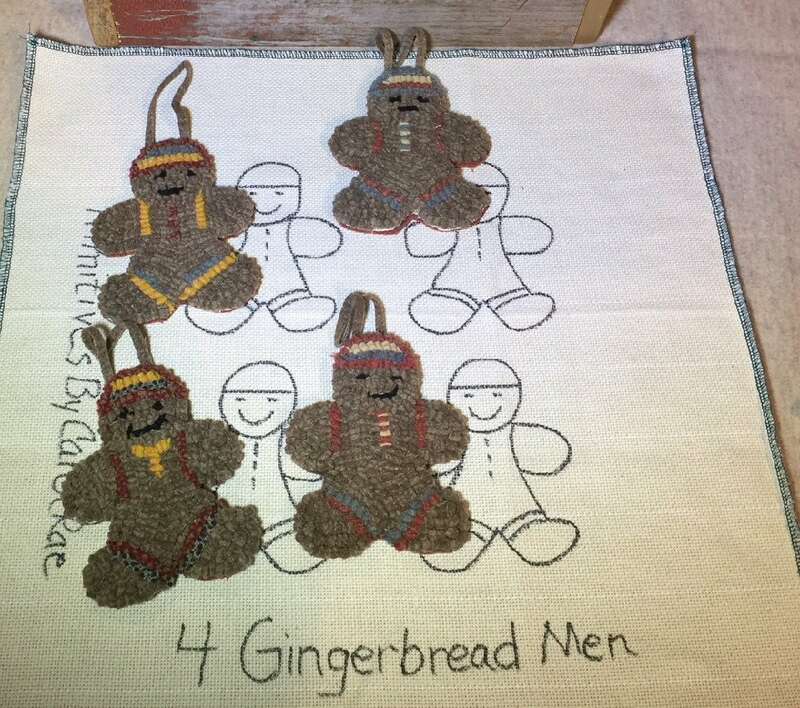 This listing is for the Rug Hooking Kit to hook my design "Gingerbread Ornaments". I have hand drawn the design on backing that is approximately 20" x 20". It is surrounded by a border 4 inches wide or more and will fit on most lap top frames or in a 14" hoop. I have serged the outside edge to prevent raveling. There will be a colored photo pamphlet of the ornaments included with the pattern. Instructions include how to finish the back with felted wool and attach the strip for hanging. I hooked them with a #8 cut (1/4" wool strips). This does not include instructions on how to hook. 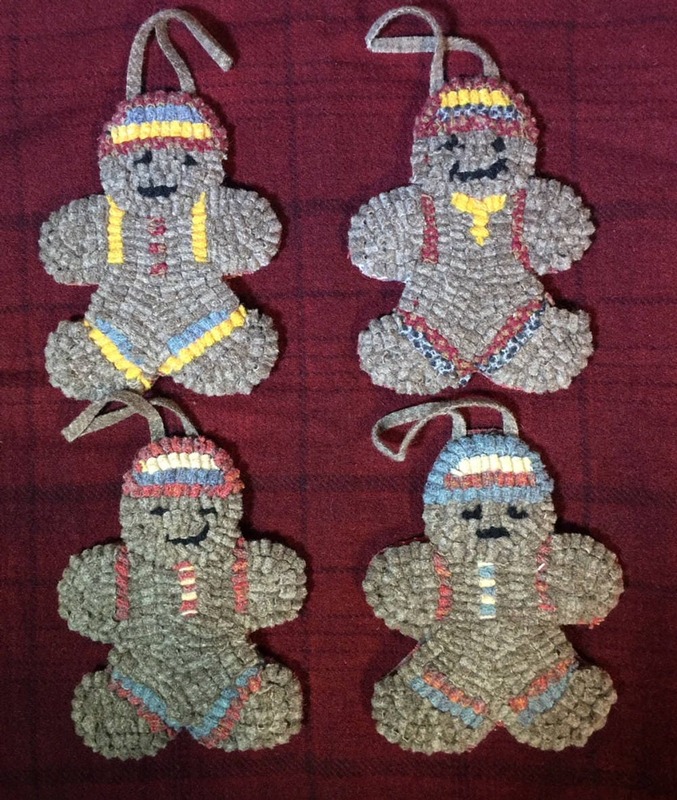 The sizes of the ornaments are approximately: 5 1/2" H x 4 1/2" W.
If you wish to purchase the pattern only for Gingerbread Ornaments, the item number is P158. You have two choices to make as you purchase this item. 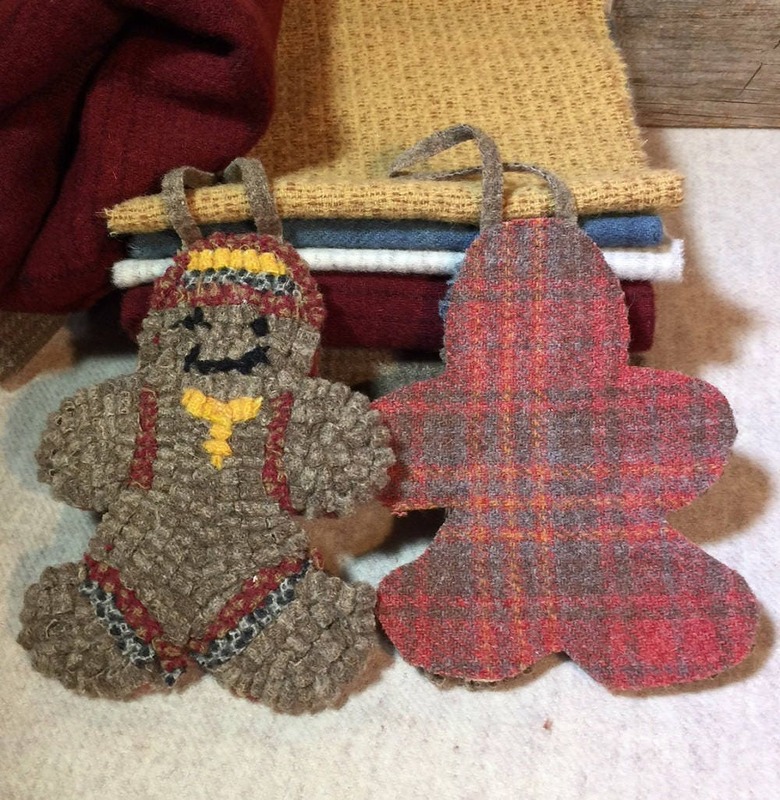 1.Choose a backing fabric of either cotton monks cloth or primitive linen. 2.Choose if you want the wool in your kit to come uncut or cut in #8 (1/4" wide) strips. 2. 100% wool fabrics that I have hand dyed and/or felted. Cut or uncut, your choice. 3. Instructions on how to finish the ornament in a phamplet with a color photo. It does not include instructions on how to hook. 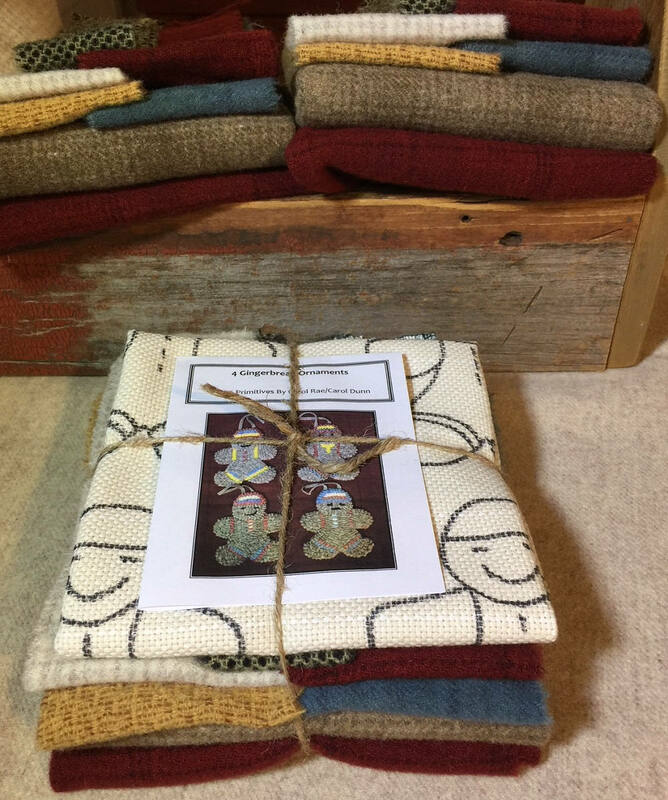 The rug hooking kits are based on the colors and amounts, of wool I used when hooking these rugs in a #8 cut. 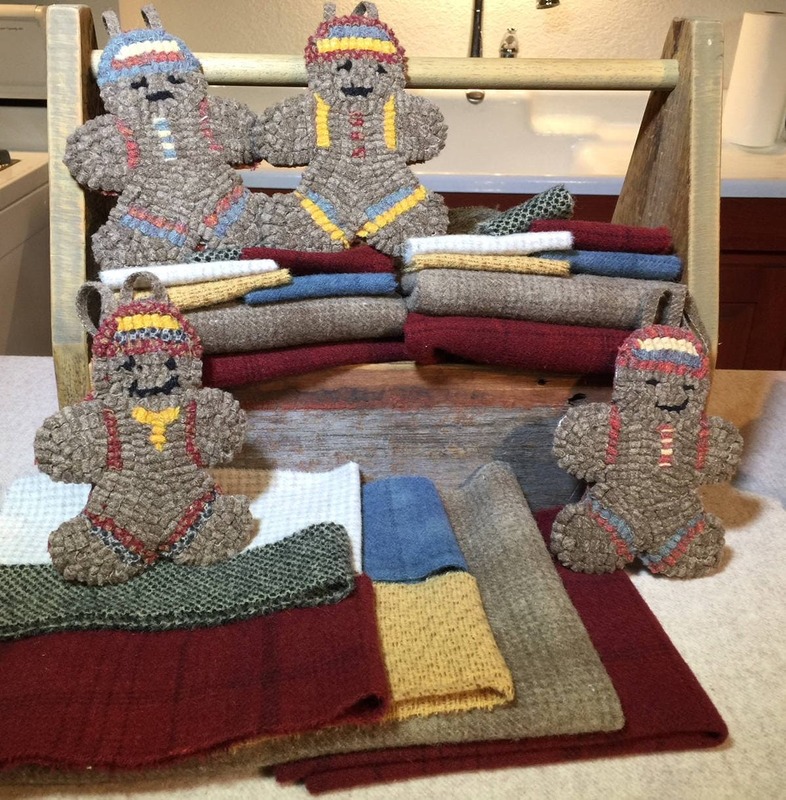 Great efforts are made to match the original wools,and to include enough wool to complete the project. If you hook tighter, higher or in a different cut than specified, you are welcome to purchase additional wool if needed. Convo me if you need additional wool and I will give you a quote. Due to inconsistencies in photography and electronic media, colors may vary from what you see here. 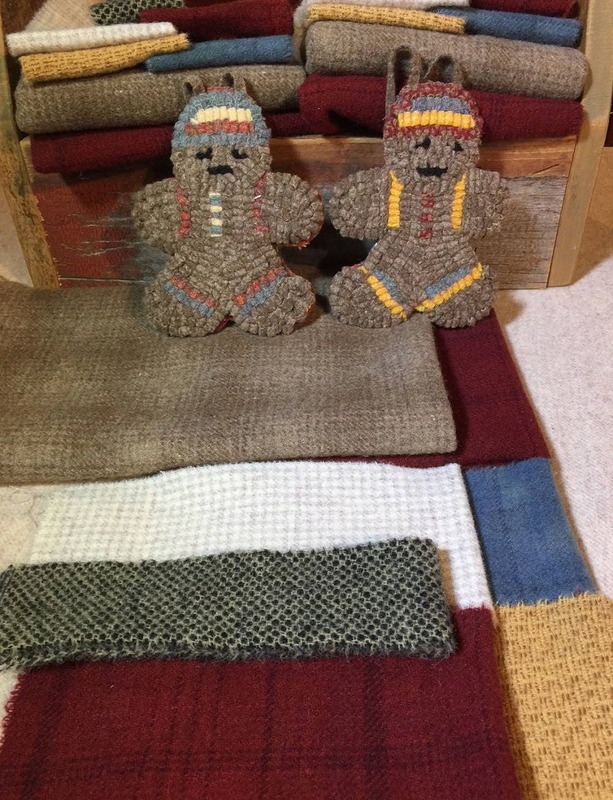 The wool selections may differ slightly from the original version, but it will look very similar to the rug in the photo. This Kit does not include a hook or instructions on how to hook. International customers, please email with your country and item list and I will be happy to give you a shipping quote. 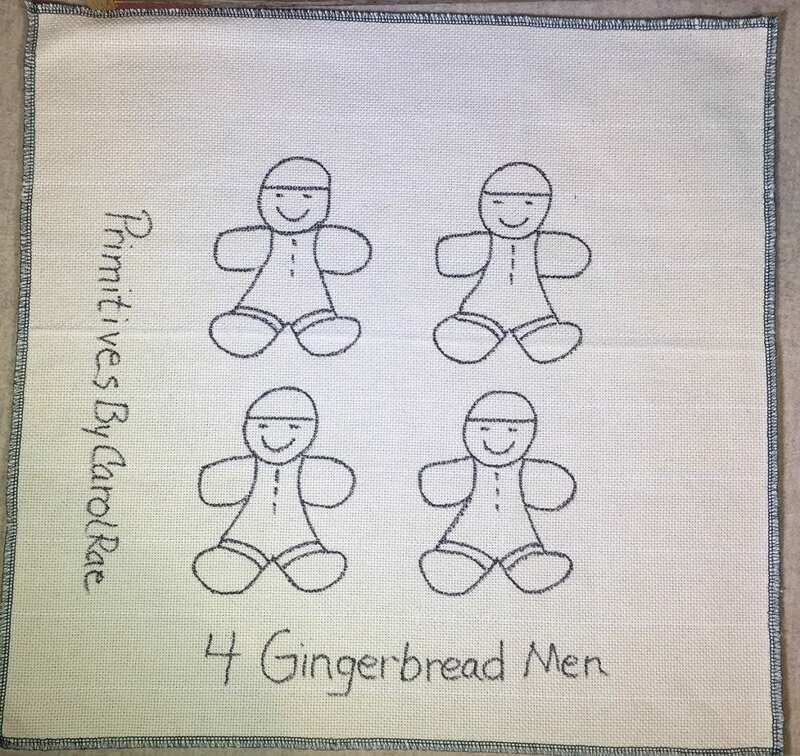 Primitives by Carol Rae accepts payment through PayPal. It is the safe, secure and easy way to pay on line. If you do not have a PayPal account, you can easily sign up, or just use your credit card at time of payment. Just click on the “Check Out With PayPal” button and it will take you through the steps. If there is a Coupon Event, please apply the coupon at Checkout. Use the name specified in the information on the Shopping Page of my site. 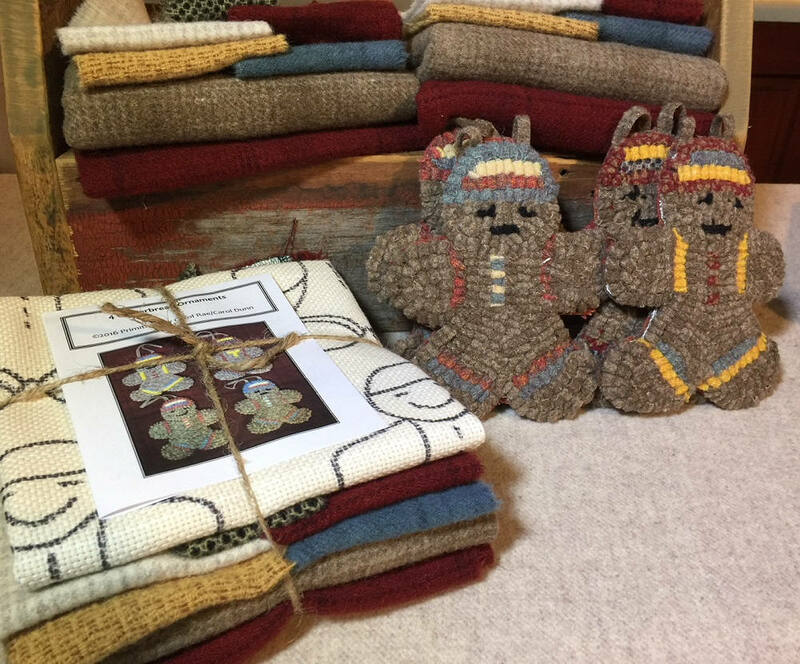 Wool and Supplies purchases are usually shipped within 1-3 business days. Hand drawn patterns Usually take 3-5 business days to get ready to ship. If it should take longer than that, I will contact you immediately. Shipment is made using USPS 1st Class or Priority Mail depending on the weight, size and destination of your package (see below). If you have a preference, or would like to upgrade, please email me before purchase and I can give you a shipping upgrade quote. I will make every effort to ship your items at the most reasonable price. If you purchase multiple items and the shipping that you pay on the order is $2.00 more than the actual shipping, I will refund the difference back to the account that you used to pay for the order. Please contact me if you have any questions about this or if you would like an actual shipping charge before ordering. Just list the items you are interested in and I will be happy to give you a quote and adjust the order. USPS First Class is for packages up to 13 oz. in weight. It usually takes 3-7 days. It is not insured or tracked, so if you would like either of these confirmations, please email before your purchase, so I can add the additional charges. Over 13 oz., I prefer to use USPS Priority Mail. Packages arrive in 2-3 days. Packages are tracked and confirmed. If you prefer this method, please email before purchase to upgrade and I will add additional shipping charges. Please contact me about shipping outside of the US or Canada. Shipping will be USPS First Class International. Tracking and insurance are an additional cost. If you would like this option, please email before purchase to get specific charges. Buyer assumes all risk of non shipment. Shipping times vary by destination and may take 3-6 weeks for delivery. Buyer is responsible for all duties and/or custom charges. If you prefer, you can upgrade your purchase to International Priority Mail. This is tracked, takes 6-10 days. If you would like this option, please email before purchase to get specific charges. You are responsible for all duties and custom fees. Primitives by Carol Rae is not responsible for delayed, lost or damaged packages. Primitives by Carol Rae wishes all customers to be 100% satisfied with their purchases. If you are not happy, please email me immediately so we can discuss options. With my permission, you will be able to return items that are still in original state and packaging within three days of receiving the package. Once it is returned to my studio, and it is in original condition, I will refund your purchase via PayPal. You are responsible for all shipping costs. 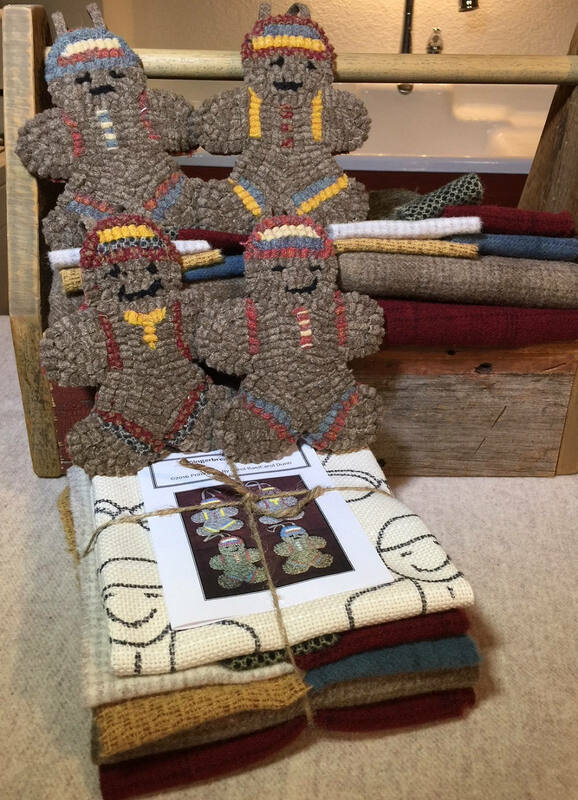 All designs, photographs and content are copyright materials and may not be reproduced or transferred in any manner without express permission from Carol Dunn. All designs and patterns purchased are for personal use only and may not be transferred, copied or given to others. Thank you for respecting the property and business of the artist.